If there was a perfect vintage portrait of a bridal party taken nowadays, it will be this photo captured during a Country Heritage Park wedding in Milton. As a Toronto wedding photographer used to photograph mostly in urban environments, I love photography locations such as Cassin House, which is perfect for outdoor wedding ceremonies and Gambrel Barn an elegant venue that will accommodate the barn wedding you always wanted. As a side note, if you're not getting married at Country Heritage Park, but you love to take your wedding day or engagement pictures there, you need to photography permit that costs $75 per hour. I remember this wedding like it was yesterday. After the first look at the Carriage House, we went to the old gas station to take some creative shots with the bride and groom. The couple rented the Country Heritage Park "Tractor & Wagon" service to move us, the photographers and the bridal party from one spot to the other. When the wedding planner informed us that we were supposed to leave for the ceremony, I noticed this old Ford tractor that I thought would be amazing for a boys environmental photograph. As such, I and my second shooter posed the boys on the tractor and around it and took a few images. This is my favourite. In this bridal party photo, the groom is writing the tractor holding the steering wheel. Behind him, there is the best man and one of his friends. On his right, there is the groom's brother while in front of the tractor we have another groomsmen. I photograph the tractor from an angle to create a diagonal from the bottom left of the top right of the frame. That gives the image a sense of movement. 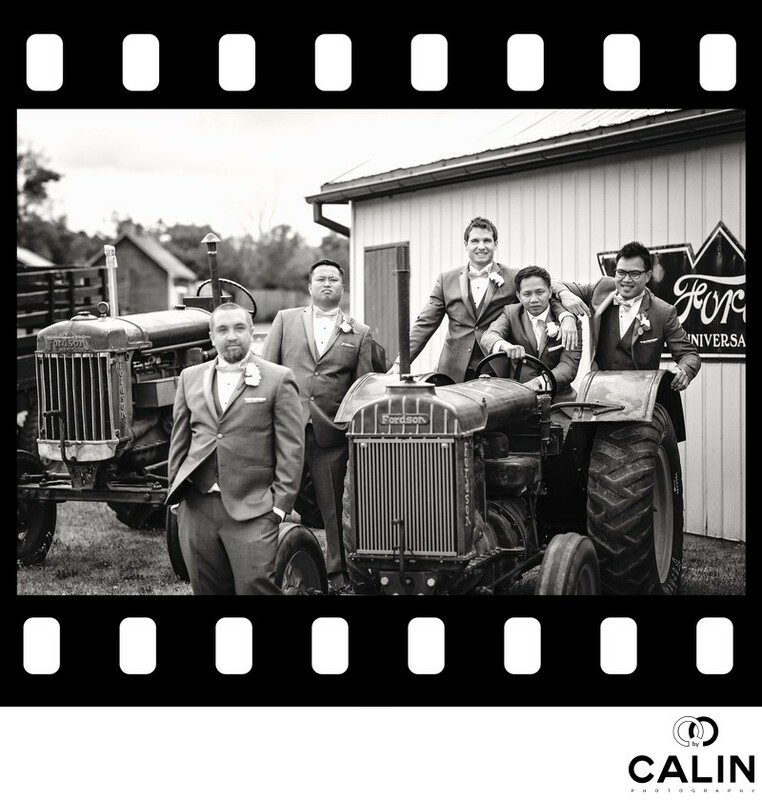 The juxtaposition of the groomsmen, dressed in modern suits and the old tractor creates contrast in this picture which helps this wedding photo tell the story. The shot was captured keeping in mind the rule of space which states that one should leave room to moving vehicles to advance in a photograph. As a result, I positioned the tractor on the right-hand side of the picture and left some space in front of it so it can breathe/move. Even more important, according to the rule of odds, the five groomsmen in this picture make it visually appealing. From a colour perspective there were too many colours in this image which did not add any value, so I decided to apply a black-and-white processing. To enhance the vintage feel of the photograph, in post processing I added a filmstrip frame which gives this wedding photo even more character. Also, I added some film grain for a more authentic look. Here are some technical details about this image. To capture it, I use the 35mm 1.4 lens shot at F2.8. As usually, my camera was a 5D Mark III, my go-to piece of equipment for wedding photography. Because a Toronto wedding photographer has to improve his work all the time, I am going to list a few areas for improvement in this image. First, the groomsmen if front of the tractor is slightly out of focus. Had this image been shot at F8, everybody in the bridal party would be in focus. Next, I wish I asked the groomsmen to look in the same spot. Because my second shooter was fairly close to me, some of the boys are looking at me, some others at my second shooter and finally one of them is looking at the wedding planner. Even better, if everybody were looking away from the camera, this image would have a more candid or documentary photography feel. All in all, this is a very strong image I'm proud to have in my portfolio. Location: 8560 Tremaine Road, Milton, L9T 2Y3.